Practically invisible in-wall and in-ceiling loudspeakers for any room, any budget. The IW65 In-wall and IC60 In-ceiling loudspeakers fit the bill nicely indeed, from dining room to utility room, kitchen to guest bathroom. In-Wall / In-Ceiling Systems, 2-Way Stereo Sound Speakers, 400 Watt Peak Power. They can not have been assembled and disassembled. High quality materials ensure long life and great performance. SONANCE VP85W In-Wall Passive Subwoofer (NEW OPEN BOX). Shipped with USPS Priority Mail. Acoustic Audio HDS10 High Definition Series Passive In Wall Sub Speaker. The sub can handle 300 watts of power and features an authentic Kevlar component 10" woofer, which responds note-for-note without coloration and has 30 percent more power handling capabilities than your typical subwoofer. And because it's so efficient, you get much more sound per watt, enabling this full-range model to work well in wide-open spaces. 90°x 90° Tractrix Horn tweeter for clean, clear highs. Crossover Frequency: 2450Hz. Origin Acoustics LCR65 Dual 6.5" Woofer, In-Wall Speaker. Condition is New. Shipped with USPS Priority Mail. 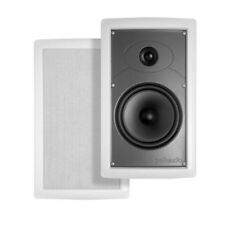 Polk Audio IW65 2 Way In-Wall Loud Speaker 6.5" Woofer Indoor Sound System White. Condition is New. Brand new never used Bose FreeSpace DS-16F Loudspeaker White 43054 Single.Speaker and shield. No manuals or paperwork just the speaker, you get what you see in pictures. Shipped with USPS Priority Mail. High Performance Outdoor Loudspeaker. The OS70 outdoor loudspeaker creates a big, full sound for a great outdoor music experience. Easy-mount locking swivel bracket affords easy aiming into listening area. 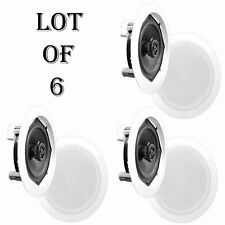 5 out of 5 stars - Polk Audio OS70 6 1/2 inch Outdoor Loudspeakers White NIB Speakers Pair 6.5"
7 product ratings7 product ratings - Polk Audio OS70 6 1/2 inch Outdoor Loudspeakers White NIB Speakers Pair 6.5"
RARE! BG RADIA ZERO BEZEL in-ceiling speakers w/ NEO3 PLANAR & 8" KEVLAR woofer! New construction?. Even better with optional NCB-8C new construction brackets! Magnets attached grill. OPTIONAL NEW CONSTRUCTION BRACKETS NOW AVAILABLE! The BG Radia PD-8Ci Speakers perform to listening room standards in an architectural speaker. Universal Wall Mount Box Speakers. Used for Audio Monitor and Surround Sound Applications. Bluetooth Wireless Music Streaming. Includes (2) Speakers (Active Passive). For Indoor / Outdoor Use. Bluetooth Connectivity. 6.5" Full Range, compact speaker. Waterproof: IP65. Magnet Protection: Plastic Water Guard. Frequency Response: 70~ 20000Hz Resp. Color: White. Material: ABS (Acrylonitrile Butadiene Styrene). We will try our best to reduce the risk of the custom duties. Klipsch Heresy III Unfinished Cherry Veneer Brand New USA Made! We do, too. No other small speaker is built as well, or passed on to as many future generations, as the Heresy III. The Heresy was originally introduced in 1957 with a compact three-way design utilizing a 12” woofer and horn-loaded midrange and tweeter. 5 out of 5 stars - Klipsch Heresy III Unfinished Cherry Veneer Brand New USA Made! 4 product ratings4 product ratings - Klipsch Heresy III Unfinished Cherry Veneer Brand New USA Made! 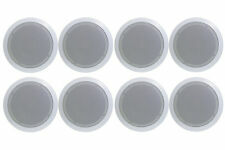 Proficient C791 8" In-Ceiling Speaker (Pair). Brand new in the box. 8" Polypropylene Woofers 1" pivoting Soft Dome Tweeters Power Handling 125W Frequency Response 36Hz - 20kHz Impedance 8 Ohm Sensitivity 92dB Thin Bezel Grilles Diameter x Depth 11 1/8" x 4 1/4" Ceiling Cut Out 9 3/4"
SONANCE IS4 Invisible Series Speaker BRAND NEW in the box comes WITH ENCLOSURE! Frequency response: 80Hz- 20kHz. We will respond ASAP! Condition: Open box. Midrange: 2" polypropylene. Its compact size, high output and outdoor-capable design makes it one of the most versatile subwoofers in the installation market.". What is Included: Subwoofer, Mounting bracket, Mounting hardware. We specialize in well-cared for, previously used gear because that is what we are passionate about. Blue Octave BDW8 Brilliance Series In Wall Passive 8" Subwoofer Speaker. 8" Woven Fiber Bulletproof Cone Woofer. This speaker is timbre-matched to all other Blue Octave speakers for seamless integration with other models. Acoustic Audio HD-S10 High Definition Series Passive In Wall Sub Speaker. 10" Woofer. Woven Fiber Bulletproof Cone Woofer Provides Low Frequency Tones. Acoustic Audio WS1005 Passive In Wall Subwoofer Amplifier. Tweeter Size 1 in. Woofer Size 6.5 in. Mounting In-wall / Ceiling. Speaker Type Main / Stereo Speakers. Construction 2-Way. Available Colors White. Connectivity Wired. Sensitivity 91 dB. HOT Wall Mount-Home Speaker System - Active + Passive Pair Wireless Bluetooth..